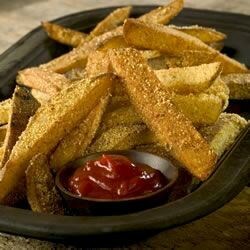 "Potatoes are coated in a spicy mixture of corn flour and Cajun seasoning then deep fried until crispy. Very simple and really crunchy. I like mine extra spicy so I soak my cut potatoes in hot sauce for a few seconds before shaking them in the dry batter." Place cut potatoes into a large bowl of cold water. Soak for 10 minutes. In a large resealable plastic bag, combine the corn flour, corn meal, and Cajun seasoning. Shake the bag to blend. Drain the potatoes, but leave them wet. Place the fries in the plastic bag with the seasoning, and shake to coat. Cook fries in hot oil for 7 to 10 minutes, or until golden brown. Remove from the fryer to paper towels to drain. Season with a small amount of salt. These fries stay crispy even reheated in the microwave! This was okay. I didn't care for the cornmeal on the fries. I couldn't find corn flour so I used all corn meal, they were fine. i omitted some spice as to not to get too hot. these fries came out just right for me. i wouldn't change a thing! These were wonderful and very easy to make, my picky kids loved them! We tried this before Super Bowl day and 10 folks "LOVED them "